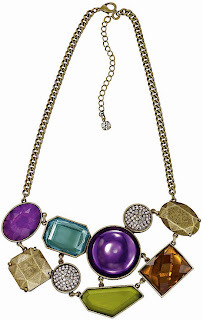 Louisa at Large Presents: Fashion Files: Become a Follower and Win a Kenneth Jay Lane Bib Necklace!! Become a Follower and Win a Kenneth Jay Lane Bib Necklace!! Here’s the deal: I get a lot of hits on this humble blog o’ mine, but the number of public followers (see left) does not reflect it and I’d like it to. So, for those of you who need an ultimatum to stand up—or at least push a button—and say, “I like Louisa at Large,” I’m giving you one. Click the button at the top left (hint: it says, “Follow”) to become a public follower of Louisa at Large between now and midnight EST on November 15 and you’ll be entered to win this gorgeous Kenneth Jay Lane bib necklace. Fellas, you can re-gift it. I won't be offended and you'll get mad props (yes, I said, "mad props") from the lucky lady on the receiving end of the deal. Oh, and FYI, bib necklaces are very in right now. As is frugal fashion. And, since KJL designed this limited edition, sold-out item for Avon, it definitely qualifies as such and you know I’m on board. Plus, the necklace is FREE for the winner, and you can't get fashion more frugally than that. What will this mean for your life from now on? Literally, nothing. The only thing that will happen is the latest Louisa at Large blog posts will show up in your Google Reader if you have a Google account and if you ever check your reader... Exactly. You’ve got nothing to lose, but a potential Kenneth Jay Lane necklace to gain. So, go on. Push the button. Everybody’s doing it. If you’re already one of my beloved followers, don’t worry; you’ll automatically be entered to win. Drawing will take place at midnight on November 15 and winner will be announced in a blog post.